Originally published in 1978 as Kansas Geological Survey Educational Series 5. This is, in general, the original text as published. The information has not been updated. The report is available as an Adobe Acrobat PDF file. 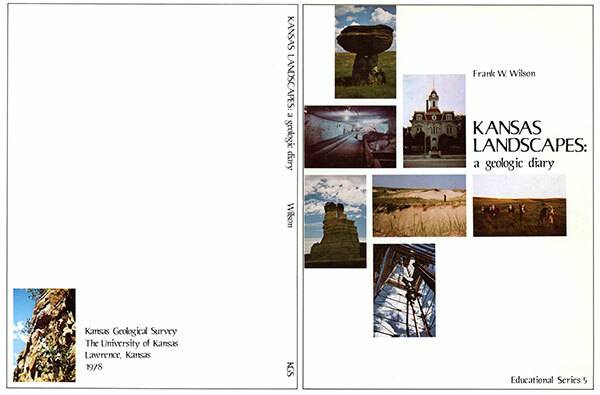 This little book is intended primarily for Kansans who are interested in learning more about the origins of the natural features of their own state, but we hope that it will also be of interest to tourists passing through Kansas. We cordially invite these visitors to interrupt their journeys long enough to visit some of the sites described in the following pages (Figure 1). Because it would be difficult to describe all of the geologically interesting and scenically beautiful spots in Kansas in such a short book, this is a geological sampler of easily accessible areas representing each of the major outcropping rock systems of the state. Most of these are from the twelve surface physiographic regions that make up the present landscape of Kansas but we will also look beneath the surface at the ancient landscapes which are buried there. Many people believe that only a geologist can "reed the rocks" and decipher the geologic history that is recorded by them, but through illustrations and examples the basic concepts of geology will be explained to help the reader to better understand and enjoy the many interesting geological and landscape features that abound in Kansas. Figure 1--Index map to localities discussed. 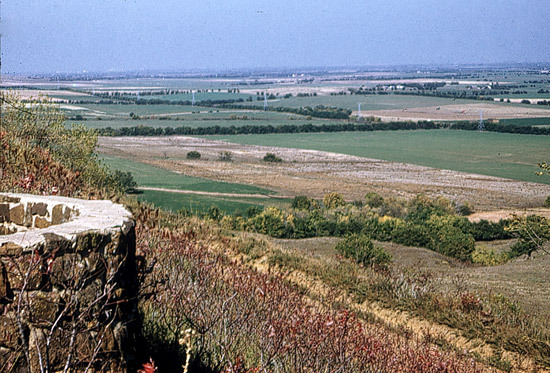 Loess bluffs along the Missouri River; "Little Switzerland"
To begin, think of the state of Kansas as a very old and tattered book lying flat on a table in front of you (Figure 2) . The bound edge of the book is the western boundary and the frayed edges of the pages are toward the east. Imagine that each page is a single rock layer because in Kansas many strata are very thin sheets of rock extending for great distances back from these edges. Although the layers may vary in thickness from place to place and may be gently bent, torn, or rumpled by natural forces, geologists can trace many of them for hundreds of miles. The thickness of the book represents the several thousand feet of sedimentary rocks that make up the outer skin of the Earth below the surface of Kansas. In a slightly different way, the rock layers can be thought of as the pages of a diary, each recording a moment in the geologic development of the state. Unlike a regular diary, however, the geologic record began at the back of the book and page after page was added as each new layer was deposited upon the one below it. 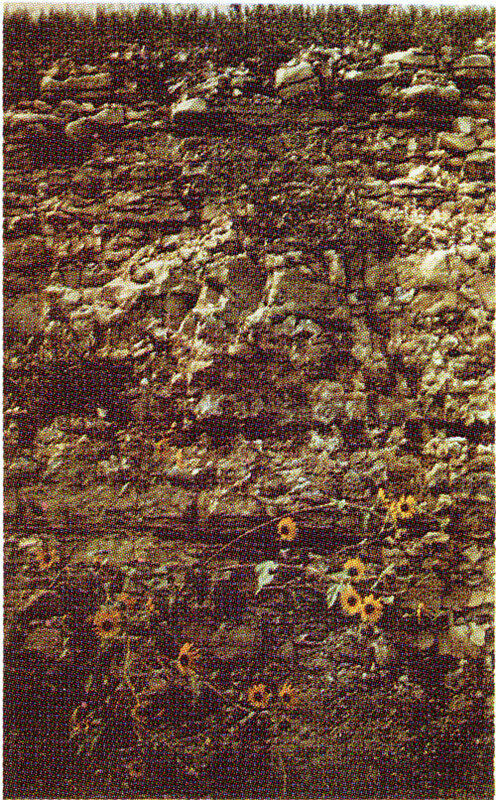 The bedrock of Kansas has not been intricately folded or overturned by earth movement, so the layered rocks remain in the same order in which they were deposited, with the very oldest layer at the bottom and successively younger beds stacked one on top of the other above it. This very simple concept (that the oldest bed is on the bottom and that each higher bed is younger than the one below it) has long been used by geologists to piece together the vertical sequence of strata (rock layers) and the relative geologic age of rocks the world over. Because individual rock layers can seldom be traced from one continent to another, fossils are used to correlate or identify strata of the same geologic age in different parts of the world. Many years ago, geologists noticed that some thick sequences of sedimentary rocks contained groupings of fossils that were abundant during a particular period of geologic time but later became extinct and were not found in strata younger than the key beds. They reasoned that rocks containing such fossils must have been deposited during the same span of geologic time no matter where in the world they were found. By tracing strata containing these key fossils from country to country, and from continent to continent, and by applying the principle that beds above and below the key horizons were successively younger or older, geologists divided the rocks of the world into thirteen major systems of strata, each of which was deposited during a particular period of geologic time. The Time-Stratigraphic Chart (Figure 3) shows the names and positions of the major geologic periods, their corresponding rock systems, and the approximate geologic ages of each. Geologic periods and the systems of rocks which were deposited during each of them may be thought of as separate chapters in the diary of Earth history. Most geologic periods and the systems of rocks that correspond to them are named for broad geographic localities where strata of that age were first recognized and described. In this way, the Cambrian, Ordovician, Silurian, and Devonian Systems were named for locations in England; the Mississippian for typical outcrops in the Mississippi Valley of the United States; the Pennsylvanian for outcrops in that state; the Permian for the province of Perm in Russia; and the Jurassic for the Jura Mountains in northern Switzerland. Other major systems and periods were not so logically named. The Precambrian, for example, does not refer to a particular geographic locality, but is applied to all rocks deposited before those of the Cambrian Period. The Triassic System was first studied and described in Germany; the name indicates that strata of that geologic age in Germany happened to be made up of three different types of sediments. A worldwide system of rocks containing chalk beds was named Cretaceous (which means "chalky" in Latin). The Tertiary and Quaternary are names left over from an 18th century classification that divided all rocks of the world into Primary (first), Secondary (second), Tertiary (third), and Quaternary (fourth) Divisions. If these names are difficult to understand and remember, be thankful that the original 18th century German designations, Urgebirge, Flotzgebirge, and Aufgeschwemmptgebirge were not retained. The main thing to remember from all this is that when geologists use such terms as the Pennsylvanian System, they are not referring to a bankrupt railroad, but to a group of rocks deposited about 300 million years ago and now cropping out in the Appalachian Mountains of Pennsylvania and, among other places, in eastern Kansas. On a day-to-day basis, geologists deal with much smaller units of rock called Formations and Members. 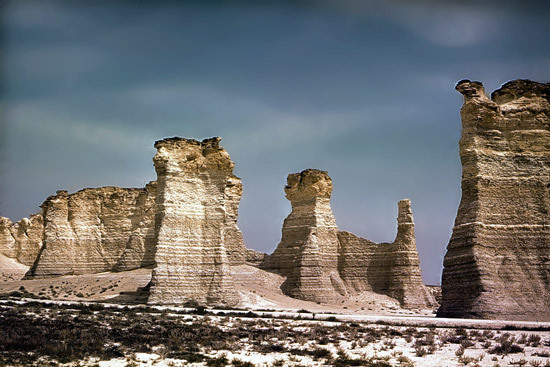 The sedimentary rocks of Kansas have been officially divided into approximately 170 Formations, each named for a geographic locality where it was first recognized and described. The Oread Limestone Formation, for example, was named in 1894 by Erasmus Haworth, the first Director of the Kansas Geological Survey, for outcrops on Mount Oread, the hill on which the University of Kansas is located. Many Formations are subdivided into smaller units called Members, also named for geographic localities. 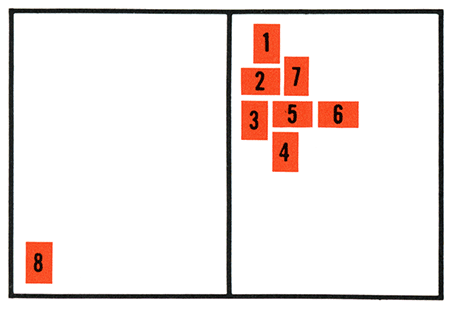 The Oread Formation is divided into seven such Members (Figure 4). One of these is the Leavenworth Limestone Member, a foot-thick ledge that can be traced for hundreds of miles along its outcrop. Although the Leavenworth Limestone Member was named for outcrops near that city, like other Formations and Members it retains the same name no matter where else in Kansas it is found. The fact that geologists can recognize and call by name hundreds of Formations and Members is a source of amazement to many people, but each ledge or bed has identifying characteristics that set it apart from the others, just as individual people have personalities that differentiate them from their fellows. So, another important key to understanding the geology of Kansas is to recognize that each individual ledge of limestone or bed of shale has a name and that, like the pages of our imaginary book, each bed has its own position in the succession of strata that makes up the landscape of Kansas. 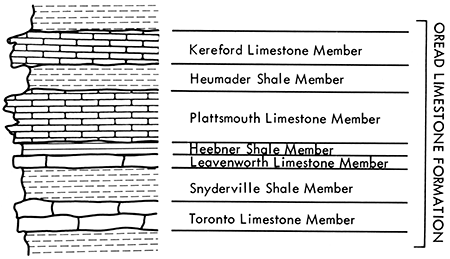 Figure 4--A sketch of the Oread Limestone Formation showing its seven named subdivisions, or Members. These beds Occur in the same order wherever the Oread Formation is found along its outcrop in Iowa, Missouri, Kansas, and Oklahoma. Perhaps the most difficult concept to grasp, but by for the most important key to understanding the processes of geology. is the concept of geologic time. The effects of weathering and erosion, which we all observe daily, are so slight that we can barely measure them in a lifetime, but they are the same processes that in millions of years wear great mountain ranges down to flat plains. Because the span of time since our planet was born is so unimaginably great, geologists have tried in many ways to illustrate it on a scale that can be comprehended. One such scheme (Eicher, 1968) is to compare the 4.5 billion years of Earth history with a single calendar year of twelve months. On that scale, the oldest rocks that have so for been discovered at the surface of the Earth would date from mid-March. Very primitive living things first appeared in the Precambrian seas in late November. and the wide-spread swamps that formed the coal deposits of the Pennsylvanian Period flourished for about four days in early December. Dinosaurs became dominant in mid-December, but disappeared the day after Christmas, at about the same time that the Rocky Mountains were uplifted. Man-like creatures appeared sometime during the evening of December 31st. and the last of the continental ice sheets of the Pleistocene Epoch began to recede from the Great Lakes area about one minute and 15 seconds before midnight. Columbus discovered America three seconds before midnight, and the science of geology was born with the writings of James Hutton just a little more than one second before the end of the year. 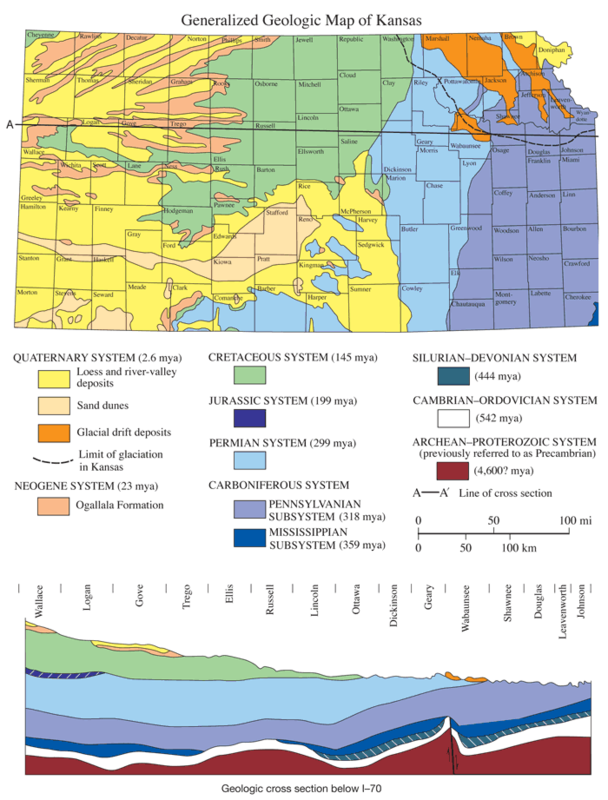 The five oldest Systems of rock (Precambrian, Cambrian, Ordovician, Silurian, and Devonian--Figure 5) are buried deeply below the surface everywhere in Kansas and are known only from the records of deep wells drilled into or through them. The first and longest chapter of geologic history is recorded in rocks of the Precambrian System. Geologists refer to these very ancient igneous (meaning that they were once molten) and metamorphic (meaning they were changed from their original form by great pressure or heat) rocks as "basement" rocks because they form the foundations for younger sediments. Even the deepest wells in Kansas have penetrated only short distances into Precambrian strata; little is known about them excepting the general shape and composition of their upper surface. Because of this, Precambrian rocks may be thought of as forming the top of the table on which our imaginary diary is laid. Unlike a tabletop, however, the top of the Precambrian is not smooth. One of the best-known wrinkles in its upper surface is the Nemaha Ridge, a deeply buried narrow rib of granite extending completely across the state beneath a line that passes near Seneca, Wamego, Council Grove, and El Dorado. The highest known point of this buried granite ridge in Kansas is near Seneca in Nemaha County where its crest is slightly less than 600 feet below the ground surface. Rocks of the Cambrian, Ordovician, Silurian, Devonian, Mississippian, and lower Pennsylvanian Systems do not extend over the crest of the Nemaha Ridge but merely lap up onto its sides. This indicates that the granite stood above sea level as a narrow chain of islands during a considerable period of geologic time while the rest of Kansas was covered by shallow seas. Younger strata lying across the crest of the Nemaha Ridge are bent up in places to form domes or anticlines which are traps for oil and natural gas (Figure 6). Because oil and gas are lighter than the salt water that saturates the porous layers, they are trapped beneath less porous zones of the bowed-up strata like a bubble of air caught under an overturned boat. Figure 6--Block diagram showing an anticline or bowed-up strata over a deeply buried granite ridge. 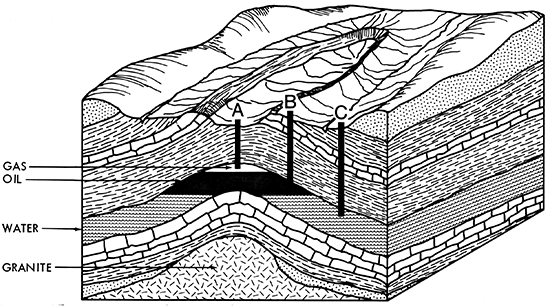 Natural gas and oil which "floor" on top of the salt water, filling the tiny openings in sandstones or other open rocks, are often trapped beneath much tighter strata at the highest part of the anticline or dome. A well drilled at point A would find gas, another at point B would strike oil, and one at point C would be called a "dry hole" because it would produce only salt water. The El Dorado Oil Field, one of the oldest and richest in Kansas, is located on such an anticline over the Nemaha Ridge. 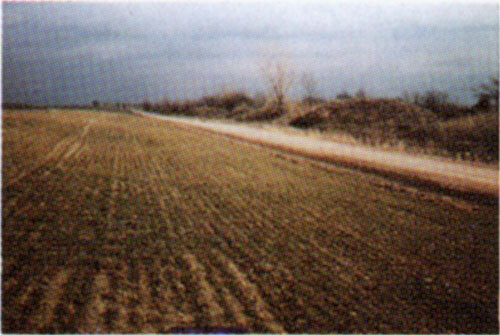 The Kansas Turnpike passes through the El Dorado Field just west of the city of El Dorado (Figure 1, site 1). 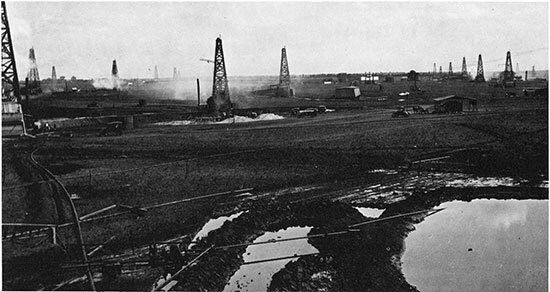 The El Dorado Oil Field in 1917. 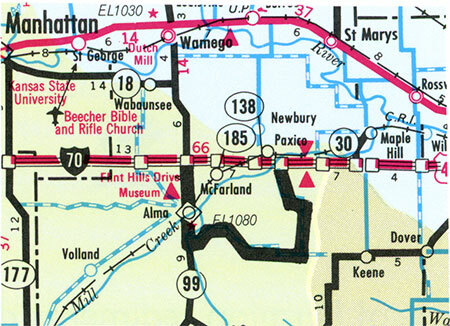 Travelers on 1-70 in Kansas pass over the crest of the buried Nemaha Ridge at about milepost 317, a few miles east of the Riley-Wabaunsee County line. The Precambrian granite at that point is about 1,000 feet below the surface. The sharpness of the ridge is demonstrated by the fact that the granite is 3,000 feet below the surface about a mile east of milepost 317 and 2,000 feet deep only a few miles to the west (Merriam, 1963). Rocks of the Cambrian, Ordovician, Silurian, Devonian and lower Mississippian Systems are also known only from drill samples, cores, and logs of deep wells. Although these rocks are everywhere hidden below the surface in Kansas, thousands of pumping oil wells remind the traveler of the rich resources contained in them. Just as many old diaries have torn or missing pages, the succession of layered rocks beneath Kansas has gaps in the normal sequence of beds where erosion in past geologic times wore away previously deposited beds and destroyed the record of millions of years. These gaps in the geologic record (called "unconformities" by geologists) were caused mainly by erosion of land areas which stood above the surface of the ancient seas. When the land surface was worn down and the seas again returned to cover these areas, the old eroded landscape was buried beneath thousands of feet of younger sediments. The only evidence now of the location of the former land area is a skip in the normal sequence of deposition where the eroded beds once were. An oil well drilled above such an area might go, for example, from strata deposited 300 million years ago (during Pennsylvanian times) directly into rocks deposited 450 million years ago (during the Ordovician Period) (Figure 7). In this instance, a geologist would recognize that several hundred feet of strata from the Mississippian, Devonian, and Silurian Systems were missing from this particular area. By plotting the location and extent of the missing beds on maps and geologic cross-sections, geologists are able to outline in three dimensions the location of ancient land and sea areas throughout geologic time. Figure 7--Sketch showing an ancient landscape buried beneath thousands of feet of younger strata. The contact between the older rocks and younger rocks (heavier line) is called an "unconformity" because strata that once were present have been eroded away and younger rocks now lie directly on top of very much older strata. Because oil and gas are often found in weathered rocks of old buried land surfaces or in reefs and sand bars which were formed near the shorelines of the ancient seas, searching for buried landscapes and shorelines thousands of feet below the plains of Kansas is important to the economy of the state. The preceding description of buried ancient landscapes illustrates another basic concept of geology: that two major natural processes, erosion and deposition, act continuously to modify the surface of the Earth. As soon as any part of the outer skin of the Earth is lifted above the surface of the seas, the forces of erosion go to work to wear the land back down to sea level. The material that is eroded from the land is carried by streams and rivers back to the sea where it is deposited, buried, and compressed into new layers of rock which millions of years from now may be lifted to the surface to start the cycle over again. The present face of Kansas shows the effect of such erosion. Thousands of feet of strata have been weathered away at the extreme southeast corner of the state and westward from that point successively younger layers of rock are exposed in overlapping strips like the ragged pages of a book that has been partly burned in a fire. As a result of this step-like erosion, motorists crossing the state from southeast to northwest travel through successive outcrops that record some 320 million years of geologic history. The shape of the land surface (topography) in each of the broad outcrop belts is influenced by the kind of rock that lies at or just below the surface and by the natural processes that molded or carved that rock into its present form. Scientists who study landforms (geomorphologists) or classify and name them (physical geographers or physiographers) have divided the state into twelve physiographic regions (Figure 8). The oldest strata exposed at the surface in Kansas are those of the upper part of the Mississippian System. These rocks were deposited 320 to 345 million years ago. They now crop out in a small triangle at the extreme southeastern corner of the state. The Mississippian sediments are limestones containing bedded chert or flint. Because chert is much harder and more resistant to weathering than limestone, erosion of the softer limestone has left a thick blanket of chert gravel and soil on the tops of all the higher ridges and hills. The cherty limestones themselves are only exposed in roadcuts or steep cliffs along stream valleys. One of the most beautiful of these outcrops is a cliff on the north side of Shoal Creek about one and a half miles south of Galena on Highway K-26 (Figure 1, site 2; Figure 9). The particular limestone exposed in this cliff contains few cherty layers. Crinoids, trilobites, and other fossils that are typical of Mississippian age rocks may be found at this site. If the scenery here reminds the traveler of the Ozarks, it is because this 55-square-mile area in the southeastern corner of the state is a part of the OZARK PLATEAU physiographic region, the only part that extends into Kansas (see physiographic map, Fig. 8) . Before being buried by thousands of feet of younger sediments, these same rocks were at the surface of the Earth at the close of Mississippian time (some 320 million years ago). The landscape may even have looked much the same as it does now. Swiftly flowing streams had notched themselves deeply into limestone bedrock and in some places flowed through caverns which had been carved into the soluble limestones by the running water. In some places the roofs of caverns collapsed to form large sinkholes at the surface of the ground. When the seas returned during the Pennsylvanian Period and again covered the region, the first muddy sediments filled the caves, sinkholes, and stream channels. Millions of years later, while Mississippian rocks were still covered by hundreds of feet of younger sediments, the brittle cherty limestones were crushed and broken by a massive shifting of the crust of the earth. Mineralized water moved through the broken rock and deposited zinc, lead, and other ores in openings in the rock. Because the mineralized water could not readily penetrate the shale that filled the caverns or sinkholes, the lead and zinc ores were commonly deposited in richest concentrations along the walls of these structures. The first prospectors and miners in the Galena district sought out these rich ore zones, which they called "runs and circles" (caverns and sinkholes). Chat piles at the west edge of Galena. Limestone cliffs on Shoal Creek south of Galena in Cherokee County. 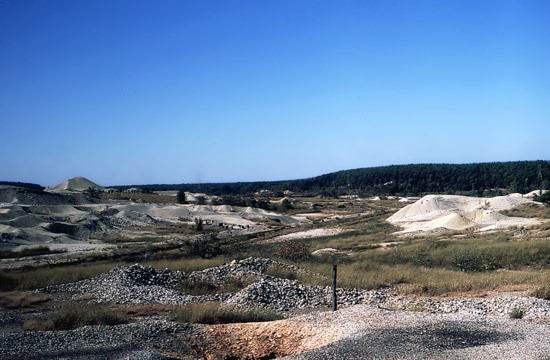 Lead and zinc mining in the Galena area reached a peak in the late 1890s but, as the shallow ores were mined out, prospecting shifted to deeper ores in the area west of Baxter Springs. 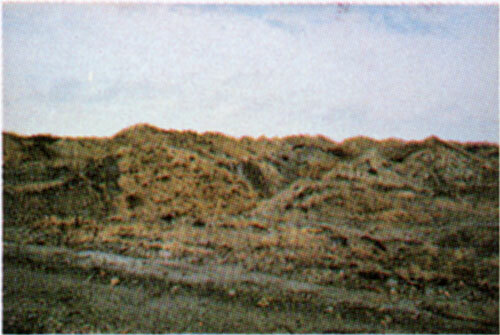 The huge piles of "chat" that presently dot the countryside southwest of Baxter Springs are evidence of the size and extent of these underground workings (Figure 1, site 3). "Chat" is cherty rock from which lead and zinc ores have been removed. Literally thousands of train-loads of chat have been hauled away to be used as roadbed material for railroads all over the United States but small mountains of it still remain. The next chapter of the geologic diary of Kansas is written in rocks of the Pennsylvanian System. Coal is so common in deposits of Mississippian and Pennsylvanian ages all over the world that in countries other than the United States, these two systems are combined into a single system called the Carboniferous (containing coal). The oldest strata of Pennsylvanian geologic age occurring at the surface in Kansas are the coal-bearing strata of the Cherokee Group. The shales, sandstones, and coals of the Cherokee Group are easily eroded and the land surface in their outcrop belt is fairly flat and poorly drained. This plain is called the CHEROKEE LOWLAND (Fig. 8). After the major period of erosion that closed Mississippian time, the region that is now eastern Kansas stayed nearly at sea level for a very long time. Great swamps covered the low-lying areas around the margins of the seas, and primitive plants (including ferns as large as the trees of today) grew densely in the bogs. Dead vegetation accumulated at the bottoms of the swamps and was later changed to coal by deep burial below great thicknesses of younger sediments. The Cherokee strata of southeastern Kansas contain at least 14 coal beds, 12 of which are thick enough to have been mined at various times in the past. The first settlers found the coal beds at the surface of the ground and "mined" them simply by breaking coal from the outcrop and loading it onto wagons. It was not until railroads were built into the area, however, that coal mining became an important industry in southeastern Kansas. Coal played a key part in the development of railroading during the period immediately before and after the Civil War. Because coal was a more efficient and less bulky fuel than wood, it was soon used almost exclusively in the steam locomotives of that day. To meet the demands of the railroads, a number of strip mines were opened during the 1870s in the shallow coals in Bourbon, Cherokee, and Crawford counties. Miners' camps sprang up near these mines, and today many of the towns of the area bear the colorful names of the old coal camps. The city of Pittsburg, now the largest city in the area, was just another of these small coal towns until zinc smelters were established there following the lead and zinc boom at Galena in 1878. 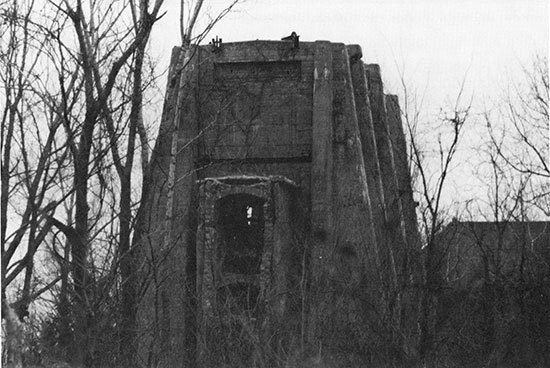 The first shaft mine in southeastern Kansas was dug in Cherokee County by the Scammon Brothers in 1874. Despite warnings from their friends that underground mining would not work at such shallow depths, the mine soon developed a capacity of 40 carloads of coal a day and within a few years underground mining became the principal method of coal production in the southeastern Kansas coal fields. 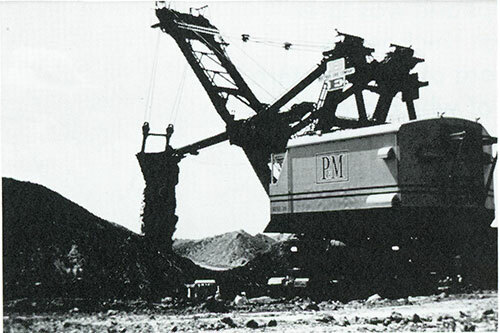 Underground mining continued in southeast Kansas until the late 1950s when it gave way again to strip mining. Beds of coal that are too thin to be mined underground can be profitably stripped by power shovels, some of which are now able to dig to depths approaching 100 feet. These monster shovels dig a wide trench down to the top of the coal, which is then dug up and loaded into trucks by smaller shovels. At the end of each trench, the big shovels turn around and move back in the opposite direction, piling the stripped soil into the trench that was just finished. When the shovels finally move on, the land looks like a giant plowed field in which each of the ridges and furrows is perhaps 100 feet wide and 50 feet deep (Figure 1, site 4). Coal stripping shovel, Cherokee County (no longer in operation). Strip-mined land from the air. The chief use of coal today is as fuel for steam-powered generation of electricity. New generating plants are being built near areas of coal reserves because it is more economical and efficient to transmit electricity by power lines to areas of need than it is to haul coal to generating plants at central points (Figure 1, site 5). As the public's use of electrical power climbs higher each year, more and more of the earth will be dug up to supply the coal to meet the demand. Only a few years ago this stripped ground was considered ruined, but a new concern for the earth and its proper management for future generations has changed this view and efforts are now being made to reclaim the land. 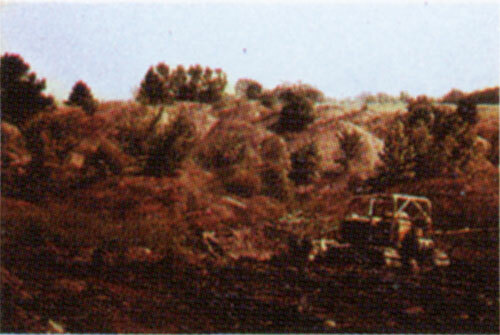 Since 1969 Kansas legislation has required coal companies to level the newly stripped land to a rolling terrain and plant it to trees or grass. 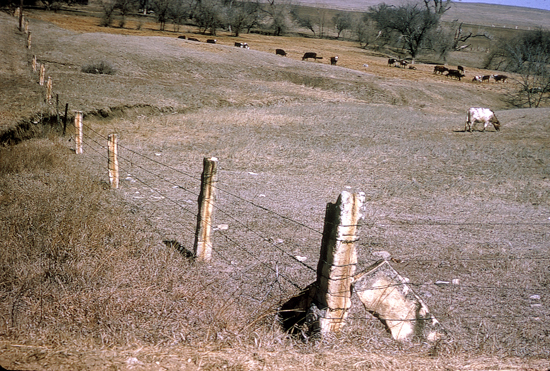 Many years before the general public was aroused to the need to preserve the environment, a few coal companies and several private landowners in southeast Kansas had proved that the stripped ground could be leveled, planted to grass, and returned to productive use as grazing land. Following their lead, and with financial aid and technical assistance from state and federal agencies, other private landowners have made a start toward reclaiming the 40,000 acres of strip-mined lands in Cherokee and Crawford counties. Leveled land seeded to grass. Reclaimed land several years later. 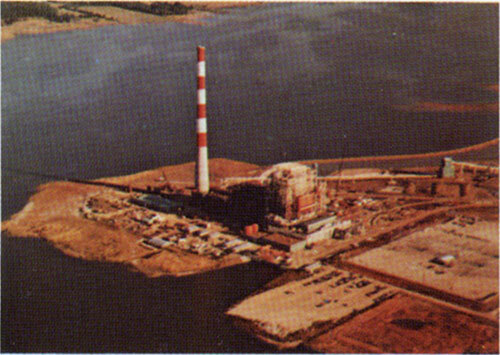 Until generation of electrical power by nuclear energy is developed as a safe and practical process or other alternatives become economical, coal will continue to play an important part in the economy of Kansas, and efforts to convert the formerly wasted stripped lands into a useful resource will continue. LaCygne Power Station, Linn County. The outcrop of the Cherokee coals extends northeastward through Missouri into eastern Iowa and western Illinois. 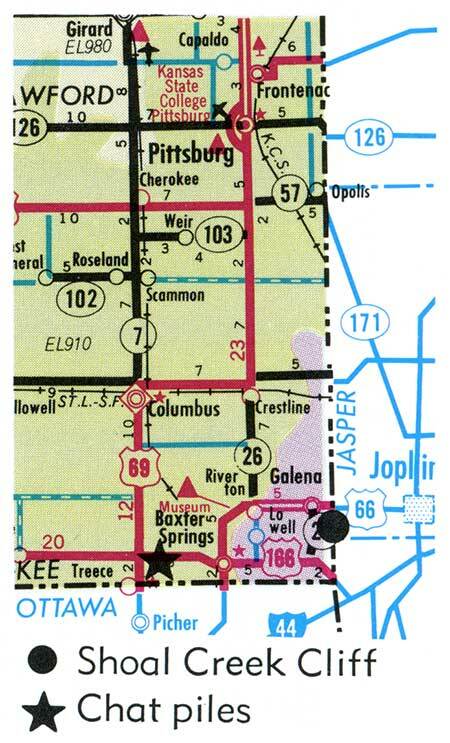 Coal had been mined in those areas for a number of years before it was extensively developed in southeastern Kansas. Major Frederick Hawn, an early military surveyor and geologist in Kansas, had studied these coals and the geology of the area between their outcrop and eastern Kansas. 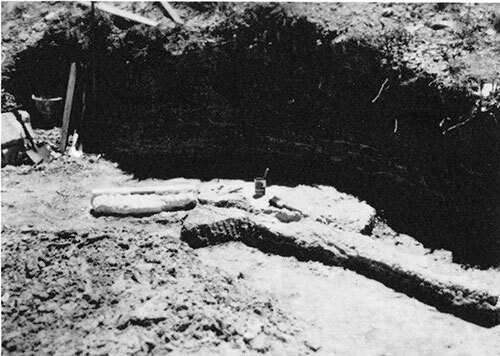 On the basis of his studies, Major Hawn predicted that the Cherokee coals existed at a depth of about 700 feet below the city of Leavenworth, Kansas. As early as 1859, Hawn organized an exploration company and with a crude drill began to sink a hole to prove his theory. His first efforts were interrupted by the Civil War and financial difficulties, but in 1865 a two-foot-thick seam of coal was found in the Cherokee shales at a depth of 713 feet. The right to mine under the Fort Leavenworth military reservation was granted by the U.S. Congress in 1868, and by 1870 a shaft had been sunk to the coal. A hole drilled from the bottom of this shaft showed four other minable coals at greater depths. During the 1880s and 1890s at least four other mines were opened in these seams near Leavenworth, including one operated by the state of Kansas at the penitentiary in Lansing. By the end of the 1890s about 1,300 men were employed in the various deep mines of Leavenworth County. Although the most productive coals in Kansas are found in the Cherokee Group of the Pennsylvanian System, other coals are scattered through the remainder of the Pennsylvanian and lower Permian Systems. There are few counties in eastern Kansas that have not reported coal mining at some time in their histories. The next pages in the Geologic Diary of Kansas are represented by the alternating limestones and shales of the upper Pennsylvanian and lower Permian Systems. These strata form the bedrock of the OSAGE CUESTAS physiographic division (Figure 8). In this area, successively younger beds overlap one another toward the west like tilted steps of a giant staircase. The limestone formations are more resistant to weathering than are the shales occurring between them and, because of that, the limestones crop out as the tops of the steps while the thick shales form the risers between steps (Figure 10). All beds slope gently toward the west-northwest, so the rise in the ground surface from one step to the next is not great. The dipping strata form a series of parallel ridges having gently sloping west faces and steeply sloping east faces. This type of landform is called a "cuesta." Figure 10--Cuesta topography developed in gently dipping, alternating hard and soft strata. Travelers become so accustomed to seeing limestone and shale beds exposed in roadcuts on major highways in eastern Kansas that they think little of them. 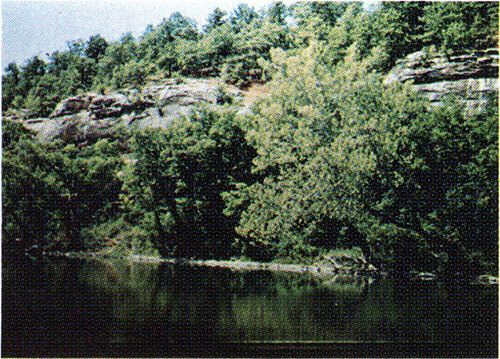 Some well-meaning people have even suggested that the ledges should be covered by soil and sod, an idea that troubles geologists because, just as foresters examine the rings of a giant tree to learn of changes in climate that affect its growth from year to year, geologists study the cyclic layering of sediments in roadcuts or natural outcrops to discover conditions that existed at those places hundreds of millions of years ago. The limestones and shales the traveler sees as he or she crosses the Osage Cuestas region of Kansas were deposited in shallow seas which lapped onto the central part of our continent some 250 to 300 million years ago. The type of rock exposed in a particular outcrop gives some indication of the nearness of the shoreline at the time that particular layer was deposited. As material was eroded from the land and carried into the sea by streams, the coarsest material was deposited near the shore while finer sediments were carried farther seaward. Although there are exceptions to this general rule, a bed of sandstone usually indicates deposition on or very near shore; layers of shale (which were once mud) indicate deposition a little farther from shore; and limestone usually indicates deposition in the open sea, far from land. A number of years ago, geologists who studied the Pennsylvanian and Permian strata of the mid-continent noted that sandstone, shale, and limestone reoccurred in predictable order upward through a vertical sequence of beds. In its simplest form, this reoccurring order was: sandstone, shale, limestone, shale, and sandstone. Geologists theorized that such a sequence represented a single advance and withdrawal of the shoreline of an ancient sea past a certain geographic point. Dozens of such cycles were soon recognized in the strata of the Osage Cuestas region and from this and other evidence, geologists deduced that the Pennsylvanian and Permian seas were relatively shallow and that their bottoms were nearly flat or only gently sloping. Because of this, small changes in sea level caused the shoreline to move great distances back and forth across the region that is now Kansas. The knowledge that each ledge of limestone is a cross-section of the bottom of an ancient sea and that the shales and sandstone exposed in roadcuts are evidence of ancient environments now alien to Kansas may make the traveler's trip across our state more interesting. Alternating limestone and shale in a roadcut on 1-70 near Manhattan. Along with abundant resources of natural gas at shallow depths, the limestones and shales of the Osage Cuestas region were once the basis of a thriving mineral industry in southeastern Kansas. Limestone is the primary ingredient in the manufacture of portland cement. The rock is finely ground, mixed with shale and other natural materials, then baked at high temperatures in rotary kilns to produce cement. In a somewhat similar manner, shales are ground, mixed with water, molded, then baked in ovens to produce brick or tile. During the late 1890s and early 1900s there were 15 cement plants and 60 brick or tile plants operating in southeastern Kansas. 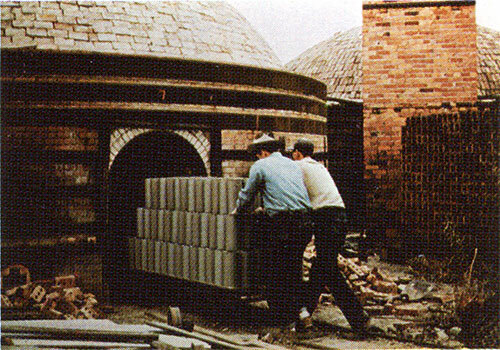 Raw tile being wheeled into a kiln for firing. 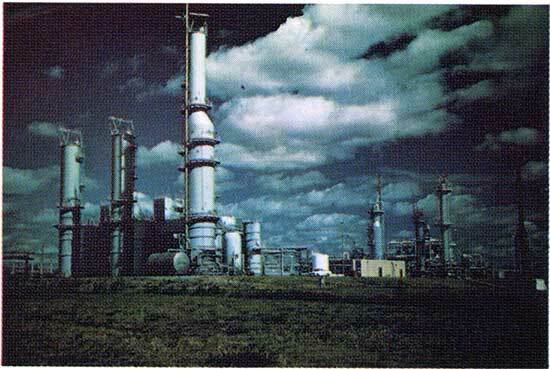 Because of the seemingly limitless supply of natural gas, other industries were also attracted to the area. Ten zinc smelters were opened in the Iola area alone and eight others were scattered through the gas fields of Allen, Neosho, Wilson, and Montgomery counties. At about this same time, the depletion of natural gas reserves in Indiana caused a wholesale migration of glass plants from Indiana to Kansas. 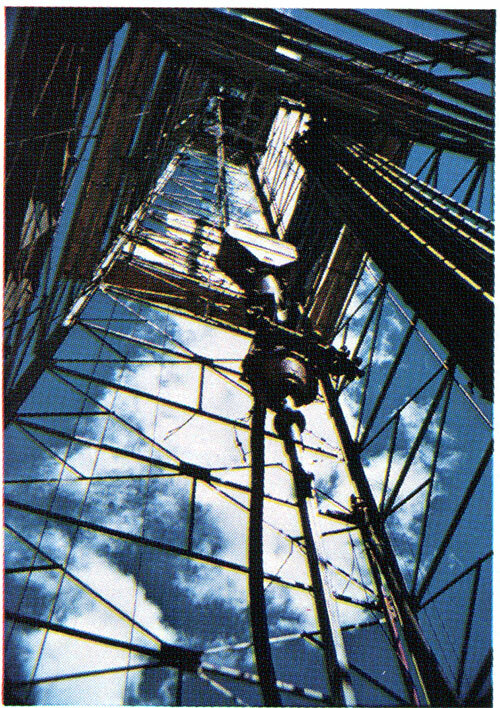 Between 1890 and 1930, 25 glass plants were moved to or established in southeastern Kansas. In many instances entire companies, their equipment, workers, and families were moved en masse to their new locations (Clark, 1970). The supply of natural gas soon waned, however, and within a few decades the industries that depended upon them began to fade away. Most of the glass plants and their highly skilled artisans moved on to new areas of abundant gas supply in Oklahoma or Texas. Some of the zinc smelters, brick plants, and cement plants were converted to coal or oil and continue in operation to the present day, but many others were shut down and abandoned. Some of the buildings that once housed brick, tile, or glass plants are now used for other purposes, but the massive concrete foundations of abandoned cement plants stand silently in the countryside, grown over by trees and weeds. Abandoned cement plant at Mildred, Allen County. 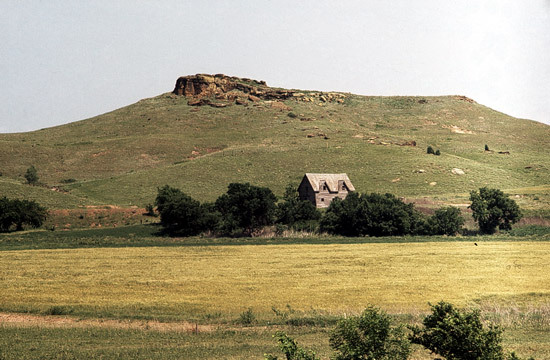 Extending northward into the Osage Plains from the southern boundary of Kansas is a sandstone-capped, roll ing upland called the CHAUTAUQUA HILLS (Figure 8). The thick sandstones underlying this area are the remains of ancient deltas deposited by streams as they emptied into the Pennsylvanian seas. Dense growth of jack oak and post oak blanket the sandstone hills and blossoming redbuds abound along the wooded valleys during th early spring. The traveler can enjoy this beautiful scenery by following the Redbud Trail, which has been marked through the hills near Sedan (Figure 1, site 6) . Sandstone outcrop in the Chautauqua Hills. The next chapter in the Geologic Diary of Kansas is written in Permian rocks which were deposited some 200 to 380 million years ago (Figures 3 and 5). The FLINT HILLS stretch across the width of Kansas along the western edge of the Osage Plains (Figure 8). Although the Flint Hills were formed by erosion of gently westward dipping strata in much the same fashion as the Osage Plains, the Permian age limestones of the Flint Hills contain numerous bands of chert or flint. Because chert is much less soluble than the limestone which enclosed it, weathering of the softer rock leaves behind a clayey soil containing much flinty gravel. This gravelly soil blankets the rocky uplands and slows the process of erosion compared with the rate of weathering in adjacent areas where the limestone bedrock does not contain chert. As a result of this, the crests of the Flint Hills are at a higher elevation than the territory directly to the west or east and, as topographic land forms, the hills themselves are older than those of adjacent areas. Limestone containing bands and nodules of flint. Flinty gravel which occurs practically at grass-root level throughout the Flint Hills region. Many Kansans call these grassy uplands the "Blue Stem-Flint Hills," and it is certainly true that it is the combination of native blue stem prairie grass, topography, and geology which makes the region unique. 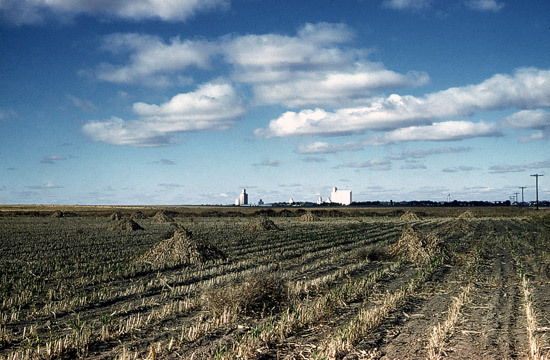 By studying fossil pollens and plant remains, botanists have determined that the prairie became dominant in the Central Plains shortly after the end of the Pleistocene Epoch or the "Great Ice Age." As the last of the continental glaciers receded toward the north, the plains were first covered by an extensive forest of spruce and pine. As the climate became even warmer and drier, the coniferous forest died out and was replaced by a deciduous forest similar to the Kansas woodlands of today, and then by prairie grasses. These changes began first in the south and gradually progressed northward across the plains. Evidence indicates.that the prairie grasses became dominant in the area of the Flint Hills about 10,000 years ago and remain so at the present. Blue stem and other prairie grasses. The virtual absence of trees on the uplands of the Flint Hills has been attributed both to the effects of periodic droughts and to lightning-set prairie fires which undoubtedly swept the plains for thousands of years before even the ancestors of the American Indian ventured onto this continent. In more recent times, both the Red Man and later the White Man purposely set fire to the prairie to burn off the dry grass. Because the prairie grasses are dormant during seasons when fires are most likely to occur, and can quickly regenerate from roots or seed when normal weather returns after a drought, they are well adapted to conditions on the plains. Trees, on the other hand, are restricted to the bottoms of valleys and to sharp breaks in topography where they are sheltered from fi re and are able to find sufficient groundwater to survive prolonged drought. Thus, with the aid of fire and drought, the grasslands remained stable for nearly 10,000 years. 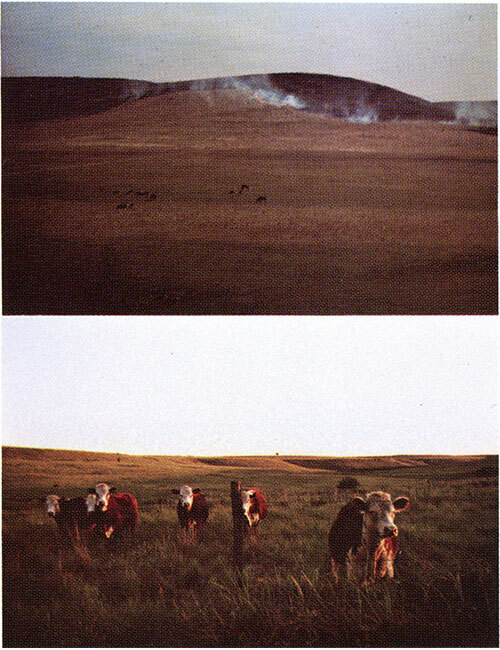 Controlled burning of Flint Hills pastures in early spring removes the coarse old grass and is followed by growth of tender new grass which cattle relish. When white settlers came to the plains in large numbers during the middle 1880s, the prairie extended from eastern Kansas westward to the Front Range of the Rocky Mountains, northward to the Dakotas, and southward into Texas. Within a few decades after the arrival of the settlers, much of this vast grassland was plowed up. 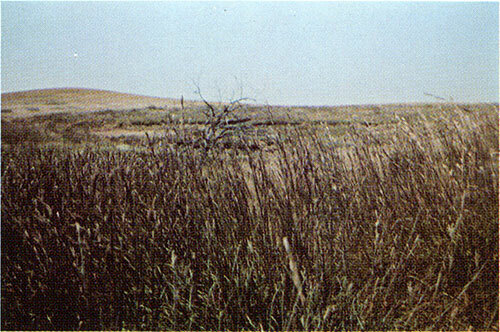 The tall-grass region of the Flint Hills was at the eastern margin of the prairie and would have been the first area to be plowed except that the flinty gravels soon convinced the "sod busters" that the land was not suitable for cultivation. Many of them moved on to the west in search of better land, but a few resourceful pioneers recognized that it was easier to work with Nature than against Her. They built their farmsteads in the sheltered valleys where water was present even in times of drought, and turned their cattle to graze on the grassy uplands. The Flint Hills region still remains largely untouched by the plow and is the last large preserve of native tall-grass prairie in the United States. Most major east-west highways in Kansas pass through the Flint Hills, and the Kansas Turnpike cuts diagonally through the heart of the hills between El Dorado and Emporia. It is difficult, however, to feel the mood of the hills while traveling through them at top speed in an automobile. To recapture the awe that must have gripped the first explorers as they viewed this vast sea of grass, the traveler must leave the busy routes and wander deep into the hills along the gravel roads that wind through the region. 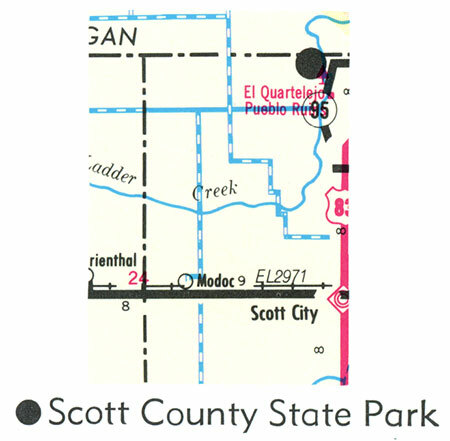 One such marked route is The Skyline Scenic Drive south of 1-70 between the Snokomo interchange west of Topeka and the Wamego-Mill Creek interchange east of Manhattan (Figure 1, site 7; Figure 11). Scene on Skyline Scenic Drive, Wabaunsee County. 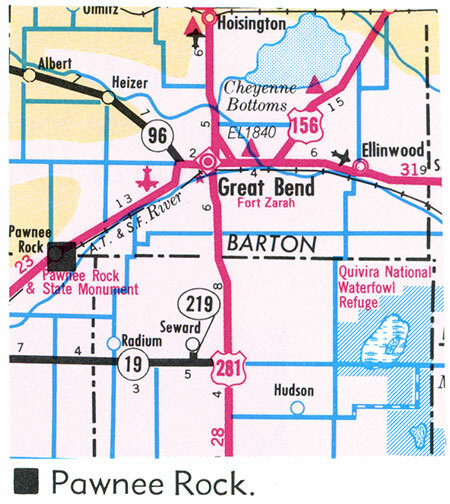 Figure 11--Location map. Skyline Drive. 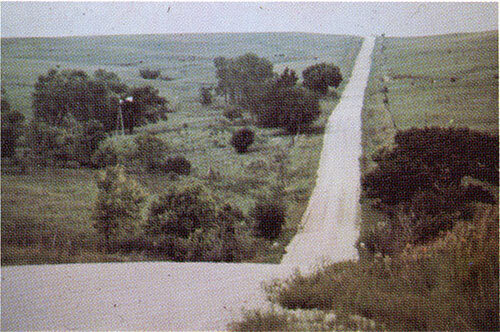 Another beautiful but unmarked route is from the Cassoday exit of the Kansas Turnpike eastward to Teterville and then generally northeastward by gravel road toward Emporia (Figure 1, site 8; Figure 12). The Flint Hills can be traversed from north to south for almost their entire length by following Highways K-99 and K-13 from the north boundary of Kansas southward to Manhattan and Highway K-177 from Manhattan south to El Dorado. 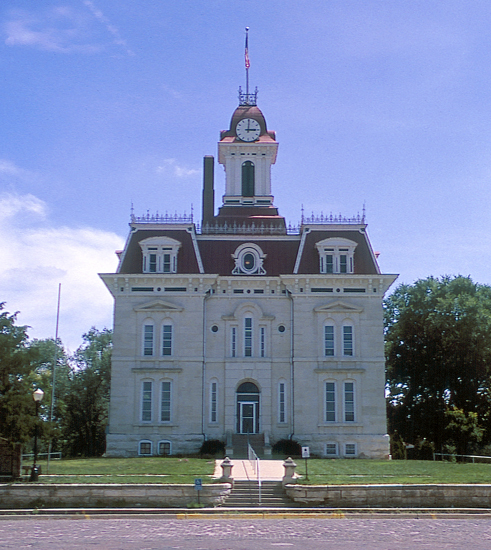 Chase County Courthouse, Cottonwood Falls. Figure 12--Location map. Teterville NE Drive. The type of Permian sediments deposited after the cherty limestones of the Flint Hills indicate that the ancient climate became very dry for a long period of geologic time. As the Permian seas shrank in size, shallow arms of these seas were cut off from the open ocean, causing great thicknesses of dark shale, gypsum, and salt to be deposited as the waters evaporated. The WELLINGTON and McPHERSON LOWLANDS (Figure 8) of central Kansas are underlain by such sediments. The beds of salt and gypsum have been dissolved by fresh groundwater near the outcrop and are seldom exposed at the surface, but great thicknesses of these sediments are present below much of western Kansas. A 300-foot-thick salt bed is mined at depths of 700 feet near Hutchinson and at a depth of 1,000 feet near Lyons. Salt beds deep below the surface in far-western Kansas occur in three horizons, totaling more than 700 feet in thickness. Valuable national records and documents are stored in deep salt mines at Hutchinson. 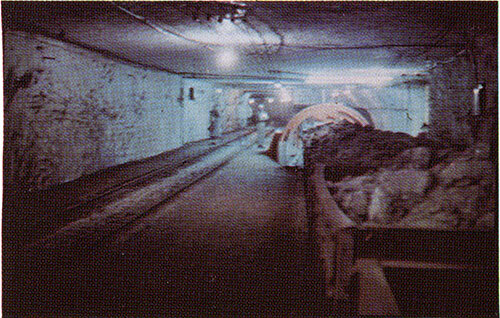 Because salt is extremely stable where it is deeply buried, the U.S. Atomic Energy Commission at one time suggested that the salt beds of central and western Kansas be used for disposal of radioactive wastes. During the latter part of the Permian Period several thousand feet of brick-red shales, siltstones, and sandstones were deposited in the area that is now Kansas. 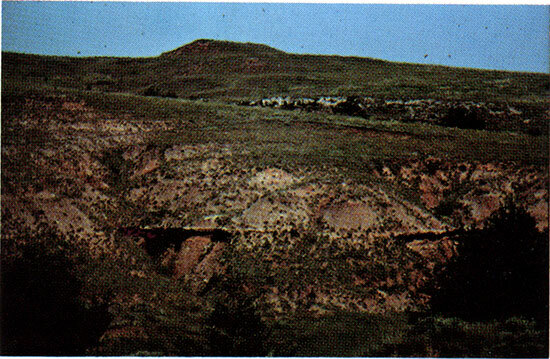 Along the southern border of Kansas, the Permian red beds have been exposed by erosion in the RED HILLS physiographic region (Figure 8). Beds of light-gray gypsum and dolomite cap the shale hills to make a ruggedly beautiful, butte-and-mesa topography unlike any other in Kansas (Figure 1, site 9). The Plains Indians called these the "Medicine Hills" and the major stream that flows from them "Medicine River." They believed that spirits in the hills and streams helped to cure their illnesses and hastened the healing of wounds. In a sense they were right, because the water of the springs and streams contains calcium and magnesium sulfates and other natural salts dissolved from the gypsum and dolomite beds that abound in the headwaters. Many of these natural chemical compounds have therapeutic and healing effects. Butte and mesa topography--red shale hills capped by gypsum. Magnesium sulfate, for example, is known to the druggist as Epsom Salts. Before the discovery of antibiotics, solutions of Epsom Salts were often used to draw infection from wounds and to promote healing. In very dilute form, it was used as a tonic in the same manner as sulfur and molasses. So, what the Red Man long ago discovered and attributed to friendly spirits, the geologist and chemist later confirmed by observation and analysis. Red Hills with beds of gray gypsum, Barber County. In Meade and Clark counties, just beyond the western boundary of the Red Hills, dissolution of the massive gypsum and salt beds several hundred feet below the surface is believed to have caused a number of large sinkholes. Big Basin and Little Basin, two well-known sinks in western Clark County, apparently formed in the recent geologic past but before historical record. Big Basin is about a mile in diameter and more than a hundred feet deep. U.S. 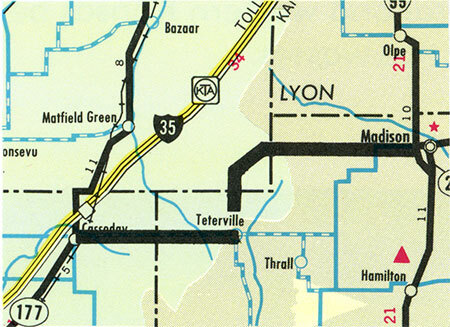 Highways 160 and 283 pass directly through it about two miles south of their junction in northwestern Clark County (Figure 1, site 10; Figure 13) . Little Basin is located on private property about a third of a mile east of the east rim of Big Basin. A pool of water in Little Basin is known as "St. Jacob's Well"
The Meade Salt Sink (Figure 1, site 11; Figure 13) formed suddenly in March 1879, about 1 112 miles south of the city of Meade, and swallowed a part of the "Jonas and Plummer Trail," a much-used wagon and cattle trail of the period. The hole was about 60 feet deep and 610 feet in diameter. It gradually filled with salt water to within about 15 feet of the ground surface. At one time, salt was produced commercially by evaporating the water from this sink. It is now partly filled with sediment and usually is dry. 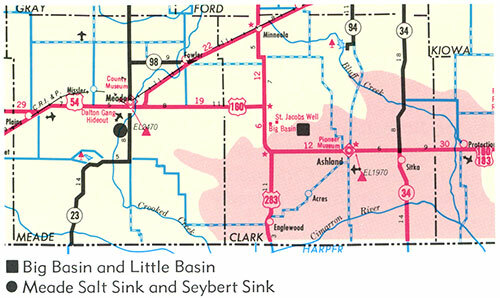 In April 1973, a new sink began forming about 1/2 mile northeast of the old Meade Salt Sink. This sink has been named the Seybert Sink. 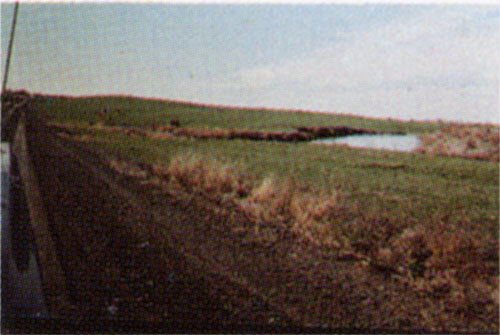 In addition to these well-known sinkholes, geologists believe that the extensive lowland north of the Cimarron River in Clark and eastern Meade counties (Figure 1, site 12) was formed by dissolution of the deep gypsum and salt horizons, which resulted in sinking of the ground surface over wide areas. These sinkholes were incorporated into the Cimarron River drainage system by normal surface erosion which eventually smoothed the floor of the depression into a plain several hundred square miles in extent. According to this theory, Big and Little Basins are a part of the continuing solution-subsidence process and will eventually be swallowed by enlargement of the Englewood-Ashland Lowland. Rocks of Triassic age are not recognized in Kansas. 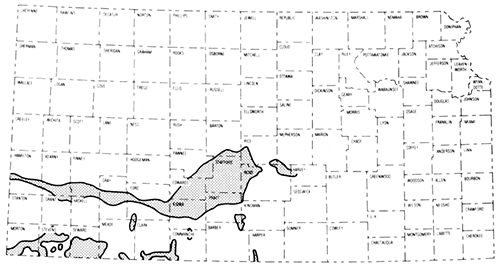 Strata thought to belong to the Jurassic System (Figure 5--cross-section) are found in the subsurface and at the surface in only two small outcrops along the Cimarron River north of Elkhart in Morton County at the extreme southwestern corner of the state. The next major chapter in the Geologic Diary of Kansas is written in rocks of the Cretaceous System (Figures 3 and 5). Cretaceous is Latin for "chalky," and chalky sediments are typical of this system of rocks throughout the world. The famous White Cliffs of Dover on the eastern coast of England, and the chalks of the Paris basin, for example, are of the same general geologic age as the chalks of western Kansas. The outcrop belt of these rocks is the SMOKY HILLS physiographic region (Figure 8). The front of these uplands can be seen for a considerable distance as they are approached from the east. They were probably called the "Smoky Hills" by early settlers because they are often partly obscured by atmospheric refraction and haze. The Smoky Hills are actually made up of three levels of uplands, each capped by a successively higher and younger group of erosion-resistant rocks (Figure 14) . 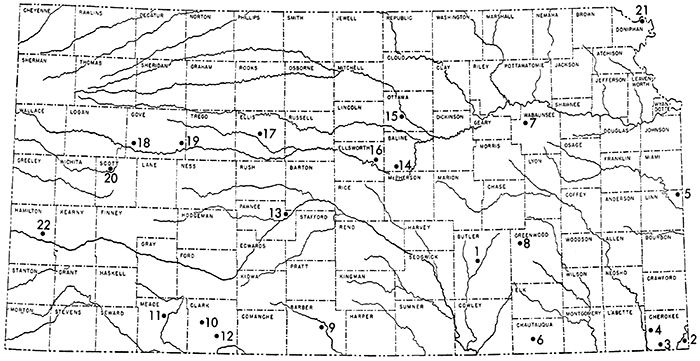 Figure 14--Subdivisions of the Smoky Hills. 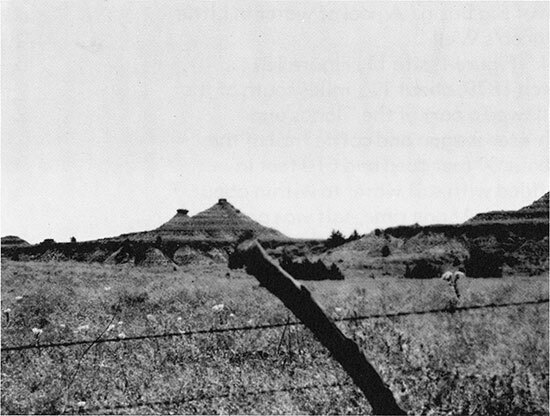 The easternmost range of hills is capped by thick sandstones of the Dakota Formation. The eastern edge of this region is marked by outlying hills and buttes that rise sharply above the surrounding plains. These high hills furnished excellent vantage points both for early explorers and for raiding parties of warlike Indians who sought to protect their hunting grounds from encroaching settlers. 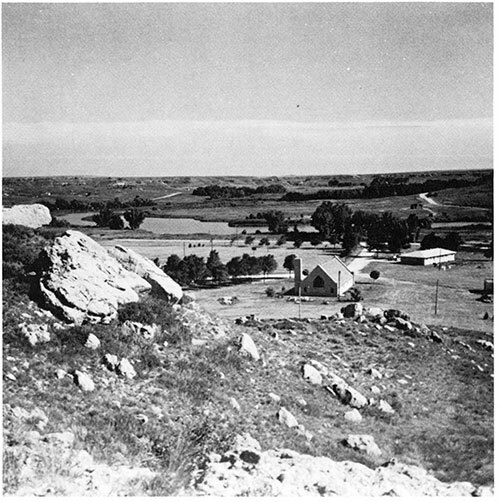 Pawnee Rock in Barton County (Figure 1, site 13) and Coronado Heights north of Lindsborg in Saline County (Figure 1, site 14) are two such historic sites. Pawnee Rock was a famous landmark on the Santa Fe Trail. It was once considerably higher than it is now, but much of the sandstone was quarried in earlier days for building stone (Figure 15). It was named for a band of Indians besieged there by a larger war party of another tribe. Coronado Heights are so named because they presumably were on the route of Coronado, the Spanish conquistador who explored this region in 1541 searching for Quivira, the fabled "City of Gold." Coronado is thought to have climbed to this vantage point to survey the surrounding plains. View from Coronado Heights, Saline County. Rock City (Figure 1, site 15), south of Minneapolis in Ottawa County, and Mushroom Rocks State Park (Figure 1, site 16), south of Carneiro in Ellsworth County, are areas of unique geologic interest in the Dakota Sandstone country. 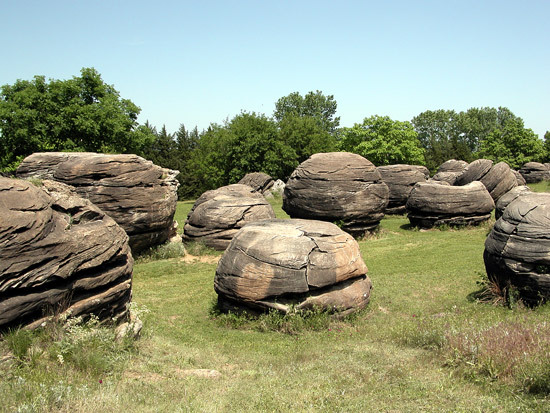 At Rock City, huge spheres of sandstone, some as large as 27 feet in diameter, dot the surface like giant bowling balls. 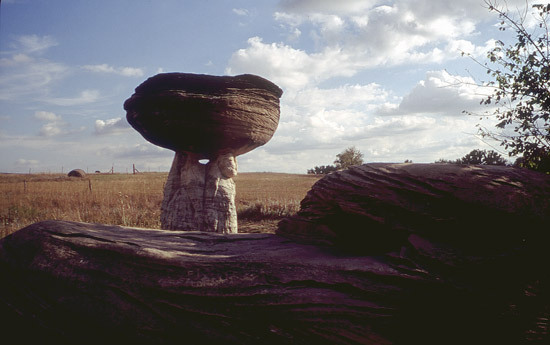 At Mushroom Rocks State Park, similar rocks are balanced on natural pedestals of softer rock. The spheres are caused by differential erosion of the Dakota Sandstone. Both of these areas were once covered by a considerable thickness of sandstone. Groundwater circulating through the sandy rock deposited a limy cement which grew outward in all directions from calcite crystals or limy fossil fragments scattered throughout the sandstone. As the softer uncemented portions of the sandy rock were weathered away by erosion, these spherical zones of cemented sandstone remained. Although some of the giant concretions have toppled from their pedestals, bedding exposed on the sides of the spheres indicates that most of them remain in their original positions (Figure 16). Rock City, near Minneapolis, Ottawa County. Mushroom Rock, Mushroom Rocks State Park, Ellsworth County. Small fist-size sandstone concretions from the Dakota Formation are commonly found around the shoreline of Kanopolis Lake. Many of these concretions are hollow inside and look like crudely shaped pots. Others, when broken, are found to have a shiny metallic interior made up of pyrite, or "fool's gold." The beautifully rugged topography that characterizes the Dakota Sandstone country is nowhere better displayed than in the vicinity of Kanopolis State Park and Lake (Figure 1, site 17). This area rivals the Flint Hills for the beauty of its natural prairie. Much of the Dakota Formation was deposited on land, and fossils of land plants and ancient animals are often found in the sandstones. Beds of lignite or "brown coal" in the upper part of the Formation are evidence of deposition in shoreline swamps that marked the return of marine waters that covered central and western Kansas in later Cretaceous times. 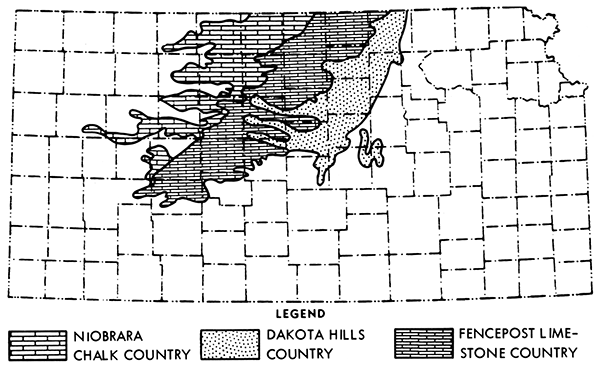 The Graneros Shale, which overlies the Dakota Formation, was deposited in gradually deepening seas as the shoreline moved northward and westward across the western part of the state. Where the dark gray Graneros Shale is not thickly covered by vegetation, the exposed slopes are often littered with large prisms of selenite, or crystalline gypsum. The middle range of uplands in the Smoky Hills physiographic region is capped by interbedded thin chalks and chalky shales of the Greenhorn Limestone (Figure 14). The base of the Greenhorn Limestone is marked by a thin, sugary-appearing limestone bed. By carefully searching outcrops of this limestone, amateur collectors may find well-preserved sharks' teeth and remains of other marine fossils. Considering the ferocity of present-day sharks and the probability that their ancient ancestors were more numerous and even fiercer, the abundance of sharks' teeth in this thin deposit causes one to wonder how any other creature could have managed to survive in the Cretaceous seas. The Greenhorn Formation is made up of thin, chalky limestone beds (usually less than a half-foot thick) alternating with thicker beds of grayish shale. Fossil clams and oysters are quite common in the thin limestone beds and one particular one-foot-thick limestone near the middle of the Greenhorn is so full of well-preserved clams and oysters that it is known as "Shell rock." At the very top of the Greenhorn Formation is another one-foot-thick layer of rock called "Fencepost" limestone. When settlers first came to the Smoky Hills region, native timber for fenceposts and lumber was hard to come by on the nearly treeless plains. Because of this, both the "Shell rock" and the "Fencepost" limestones were extensively quarried for masonry stone and for rock fenceposts. The Fencepost bed was favored for quarrying because it was more uniform in thickness than the Shell rock. The soil was removed from the ledge and a line of holes was drilled into it about a foot back from the edge. Wedges were then fitted between "feathers" (rounded, tapered metal strips) into the holes and were gradually and uniformly tightened by tapping each with a sledge hammer and listening to its "ping." By carefully tapping the wedges, a slab of limestone could be split off and sawed into the proper length for a fencepost. The chalky rock was relatively soft when first quarried and could be drilled and sawed by hand, but after being set in place the rock fenceposts "cured" and became much harder. Many rock fenceposts in this region were first set in place nearly a hundred years ago. 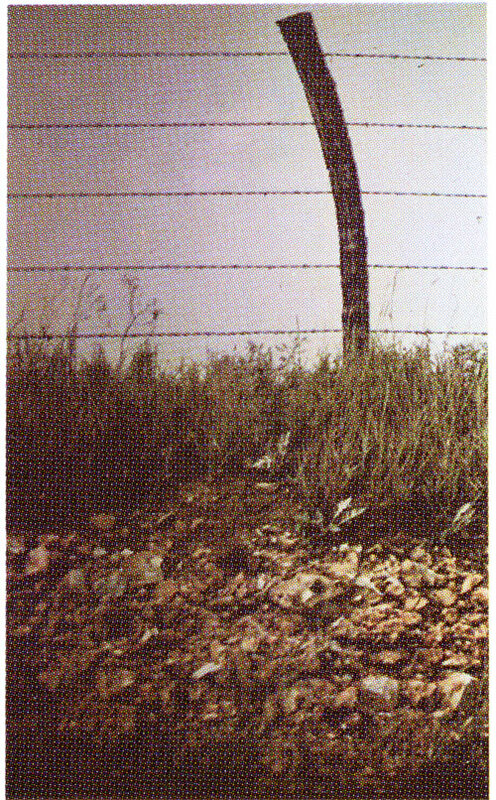 Although several generations of barbed wire have rusted away during that span of time, the posts remain in good condition. Rock fence posts, Mitchell County. 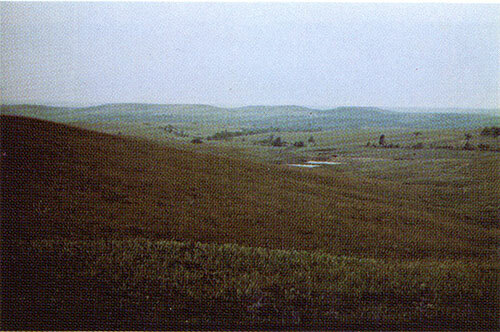 The third and westernmost range of hills in the Smoky Hills physiographic province is developed on thick chalks of the Niobrara Formation of Late Cretaceous geologic age (Figure 14). Chalk is a sediment of the open ocean, composed almost entirely of the remains of microscopic marine plants and animals which floated or swam near the surface of the Cretaceous sea. So numerous were these tiny organisms that their remains continuously settled to the sea floor where they formed a soft limy ooze that swallowed up and preserved the remains of larger animals that sank to the bottom. Preserved in the chalks of western Kansas are fossilized skeletons of extinct fishes and of giant flying or swimming reptiles. Excellent examples of these fierce-looking toothed vertebrates are displayed in the Sternberg Memorial Museum at Fort Hays State University in Hays (Figure 1, site 17) . Pleisosaur quarry, Russell County (Photography courtesy of Myrl V. Walker). The thick chalk beds of the Niobrara Formation are best exposed in bluffs of the Solomon, Saline, and Smoky Hill rivers west of a line drawn diagonally northeastward from Finney County to Jewell County. 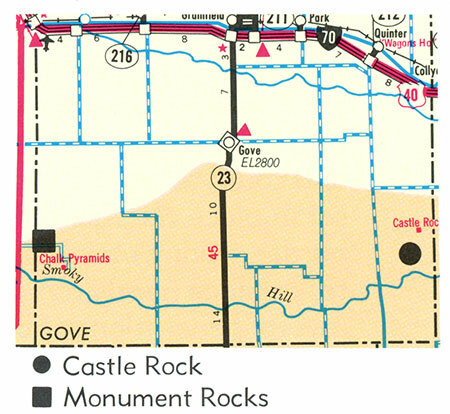 Two unique and often-photographed spots in the Niobrara outcrop area are Castle Rock in eastern Gove County and Monument Rocks in western Gove County (Figure 1, sites 18 and 19). 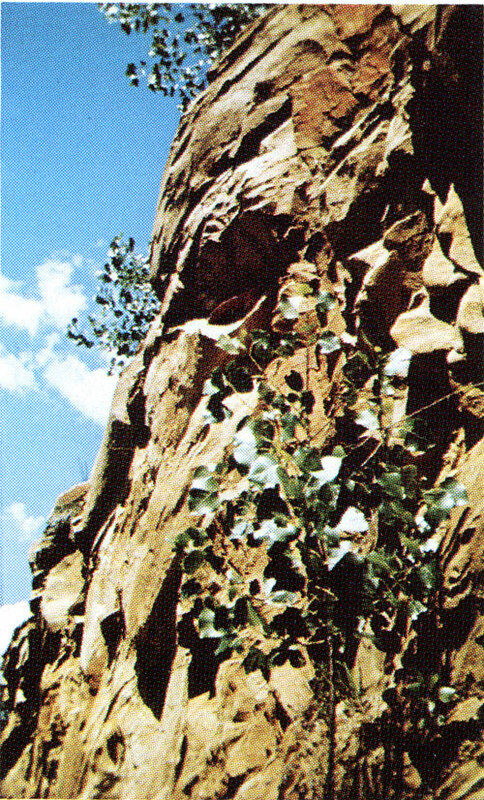 At both of these places, the ancestral Smoky Hill River carved its course through the outcrop of the Niobrara Chalk and left behind these naturally sculptured erosional outliers (Figure 17). They now stand alone on the prairie like abandoned remnants of some ancient civilization. Both of these sites are located on private land. Although visitors are welcome, they should show the courtesy of guests and be careful not to deface the monuments or to litter the grounds. Castle Rock, eastern Gove County. 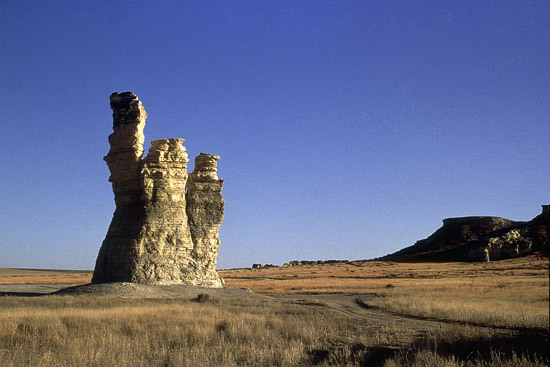 Monument Rocks, western Gove County. The great mountain systems of western North America were born near the end of Cretaceous times. During the Tertiary Period that followed (Figures 3 and 5) , the mountains continued to be slowly uplifted by massive movements of the Earth's crust. Streams flowing eastward across eastern Colorado and western Kansas were choked with rock debris eroded from the newly formed Rocky Mountains. So great was the mass of eroded material that it literally overflowed the stream valleys and spread out over the uplands. By the end of the Tertiary Period (which lasted for about 60 million years) the upper surface of this immense sheet of sand and gravel formed a gently eastward sloping plain extending from the eastern front of the Rockies to the west slope of the Flint Hills in central Kansas. The HIGH PLAINS of western Kansas (Figure 8) are the uneroded remnants of this extensive plain and the great wedge of sand and gravel which lies below the surface is the Ogallala Formation (Figure 18). 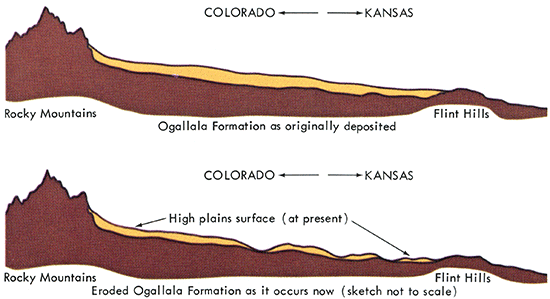 Figure 18--The Ogallala Formation (yellow) as originally deposited and as it occurs now (after erosion). The Ogallala is covered by a veneer of younger sediments on the uplands, but it is often exposed in the bluffs of the streams which cut through it. In many places, the sand and gravel of the Ogallala contain caliche, a soft limy cement deposited by evaporating groundwater. These zones are called "mortar beds" because the limy material could be calcined by heating it over open fires; it was used by early settlers as mortar for laying up their houses of native Fencepost or Fort Hays limestone. 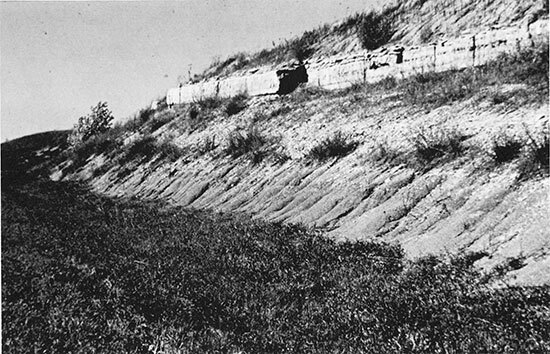 Outcrops of Ogallala mortar bed are beautifully exposed in the bluffs around Scott County State Lake (Figure 1, site 20). Ogallala mortarbeds, Scott County Lake. The Arkansas and Cimarron rivers are present-day analogs of the Tertiary-age streams that deposited the Ogallala Formation. Both the Arkansas and Cimarron originate in the Rocky Mountains and their valleys are filled with sand and gravel eroded from those mountains during Pleistocene and more recent times. Except in times of flood, the water is barely visible above the surface of the valley-filling sediments, and much of the flow is through the sandy deposits themselves. The great expanses of sand which form the ARKANSAS RIVER LOWLANDS and the GREAT BEND LOWLANDS (Figure 8) and other deposits south of the Cimarron River in southwest Kansas are similar to those that make up the Ogallala Formation. If you can imagine the Arkansas and Cimarron rivers meandering back and forth across Kansas for another 60 million years, leaving in their abandoned channels the reworked sediments of the eroding Rockies, then you can visualize the process that formed the High Plains. The huge supplies of groundwater contained in Tertiary and Pleistocene deposits of western and southwestern Kansas are among the most important natural resources in the state. Like oil and gas, these supplies were once considered to be limitless, but groundwater hydrologists now know that water is being pumped out for irrigation and other uses faster than it is being naturally replenished. 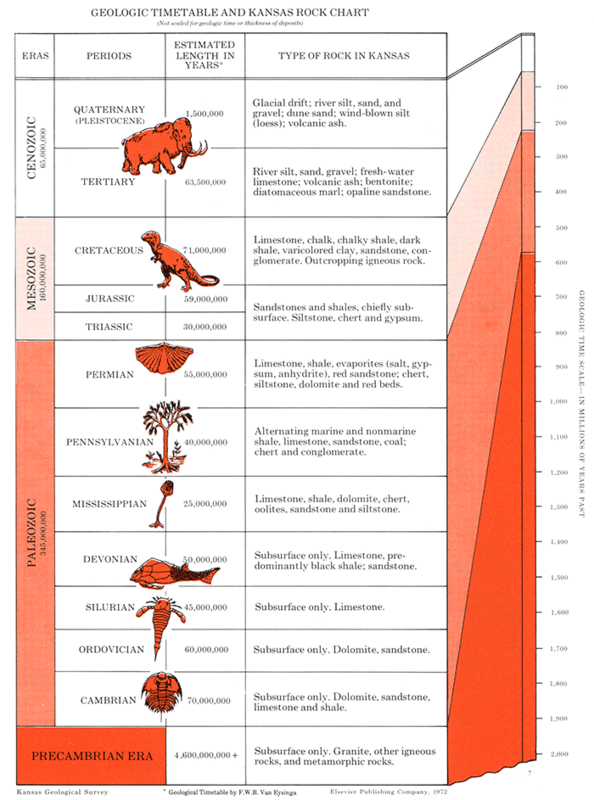 The last and perhaps unfinished chapter of the Geologic Diary of Kansas was written during the Pleistocene Epoch (Figure 3). The Pleistocene is often called the "Great Ice Age" because at its climax nearly a third of the surface of the Earth was covered by glaciers, or thick sheets of slowly moving ice. Scientists do not agree as to the ultimate causes of the ice age, but they generally agree that winters became longer and more severe and summers became shorter and cooler. Snow that fell in the polar regions and at higher elevations of the newly uplifted mountain ranges during the long winter season did not have time to completely melt during the short summers, so it accumulated from year to year. As new layers of snow were added, the older snow was compacted into solid ice. The compressive strength of ice has certain limits; when the depth of snow and ice reached perhaps 200 feet, the ice at the bottom of the snowpack could no longer carry the weight, and it was slowly squeezed outward or downslope from the centers of heavy snow accumulation. The year-to-year excess of snow continued for tens of thousands of years and provided the driving force to push the edges of the ice sheets farther and farther into warmer latitudes. Like slow-moving lava flows, the great glaciers which resulted overrode everything in their paths. At least four major advances of the continental ice sheets are recognized, each separated by a period of warmer climate when the front of the ice melted back toward its source. The first glacial advance barely extended into northeastern Kansas, but the second covered much of the northeastern corner of the state north of the Kansas River and east of the Blue River (see Glaciated Region on Figure 8). The third and fourth surges of ice did not reach Kansas, but wind-blown silt and stream-borne sediment from the melting glaciers were spread over much of the state. Many Kansans find it difficult to imagine a part of their state covered by several thousand feet of ice, but evidence of the glaciers is abundant if the traveler knows where to look and what to look for. 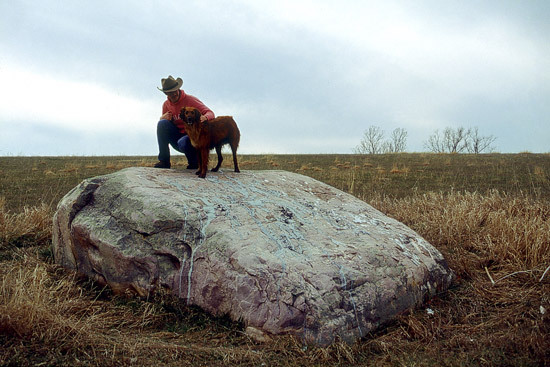 Farmers in northeastern Kansas, for example, are familiar with boulders of hard red rock which are scattered through their fields and pastures. The boulders are composed of red quartzite of Precambrian age, a type of rock that does not occur at the surface anywhere in Kansas. Its closest outcrop is approximately 200 miles north in south-eastern Minnesota and eastern South Dakota. There, great boulders and millions of tons of other rocky debris were picked up by the ice sheets as they ground slowly southward and this debris was dumped in Kansas when the glaciers finally melted back toward the north. Such deposits are aptly called "glacial till," because they were literally plowed up by the slowly moving ice. Areas in Kansas that were once covered by ice are determined by the limits of glacial-till deposits and by deep scratches in limestone and sandstone bedrock that were gouged by rocks carried along at the bottoms of the glaciers. Some of this rocky debris was carried beyond the limits of the glacial front by melting water. This material, called glacial drift, covers the higher ground in and adjacent to the area of glacial cover (Figure 5). The valleys of major streams that flowed from the fronts of the melting glaciers were choked with sediment for hundreds of miles downstream. During the periods of warmer climate when the ice sheets withdrew temporarily to the north, the streams eroded their courses down through the level of the floodplain deposited during the advance and retreat of the preceding glacier. Because of this, stream sediments from each of the later glaciers are at lower levels than the earlier ones. The uneroded remnants of these old floodplains now form a series of broad benches or terraces along major stream valleys. 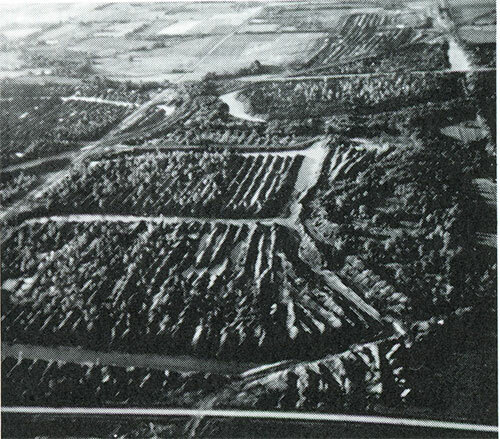 Farmers often refer to the various levels above the present floodplain as "second or third bottom" land (Figure 20). 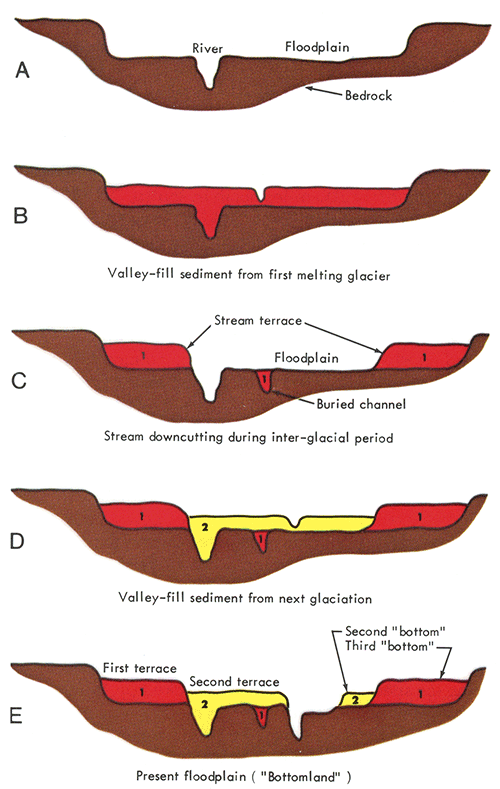 Figure 20--Cross-section of a stream valley showing development of terraces during the Pleistocene. Vast areas of dry mud and barren ground were exposed as each of the ice sheets melted. Silt was picked up from these areas by the wind and spread across much of the mid-continent by dust storms which would have made the terrible storms of the 1930s seem mild by comparison. Erosion since the Pleistocene has carried away much of this material but several feet of wind-borne silt (loess) is commonly present below the modern soil on upland areas throughout the state. Because floodplains were major sources of windblown sediment, loess deposits are thickest near larger streams that drained the glaciated areas. More than 100 feet of loess is exposed in the west bluffs of the Missouri River in Doniphan County. This area is sometimes called "Little Switzerland" (Figure 8 and Figure 1, site 21) because of the steeply rolling hills developed in these deposits. 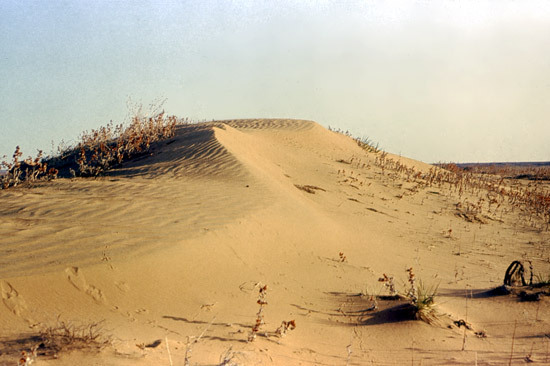 The fierce Pleistocene winds swept the sands of the Arkansas and Cimarron valleys into dunes that cover thousands of square miles (Figure 5). Most of the dunes are now covered by vegetation but their typical hummocky shape is still apparent to the traveler. An area of active dunes is present south of Syracuse in Hamilton County (Figure 1, site 22). From time to time during the Pleistocene, volcanic eruptions in the mountains to the west of Kansas spread layers of gritty, white volcanic ash over all of the central plains. The airborne ash settled out and over large areas during a few days or weeks and outlined features of the landscape as they existed at that particular brief moment in geologic time. Because the ash falls are like markers slipped between the pages of our ancient diary, geologists use them to correlate and crudely date other sediments which are interbedded with them. Many geologic time scales designate the withdrawal of the last great ice sheet as the end of the Pleistocene Epoch. However, some geologists believe that the ice age is not yet finished, and that the Earth is currently in one of the long periods of warmer climate between glacial surges. It is impossible to know whether this is true, but it is certain that the geologic diary is not yet finished and that another page is even now being written. Because Man, as an observer and recorder, has been present for such a brief moment of geologic time, it is difficult for him to perceive the exceedingly slow processes constantly at work on the Earth. One of the principal concepts of geology is that the processes which affected the Earth in past geologic times are the same as those at work today. For example, careful measurements show that the mountains of the western United States are rising a few centimeters per century. In this same manner, these great mountains were raised to their lofty heights. A Kansas farmer who watches his fields being gullied by spring floods is witnessing the same process that reduced the land to sea level many times before in geologic history. The key element is time, long periods of geologic time. Seemingly insignificant forces acting for eons have sculptured the landscape of Kansas. Ancient Hindu sages defined an eon as the time required by a dove, flying over the Himalayas once each century and brushing them gently with a silken streamer, to wear those craggy mountains down to a smooth plain. Perhaps the plains of Kansas were formed in a similar manner, by a mythical Jayhawk with a red bandanna! Many past and present members of the staff of the Kansas Geological Survey contributed to the preparation of this pamphlet. The physiographic provinces were modified from those delineated by the late Walter H. Schoewe. 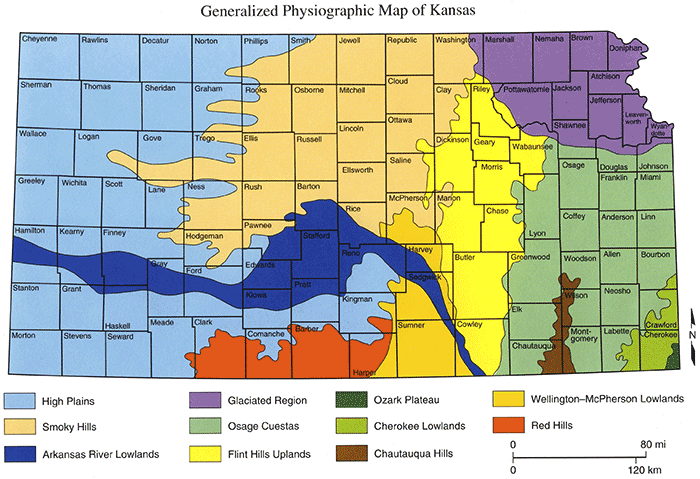 The geologic map of Kansas was generalized from the 1:500,000 scale, 1964 map, prepared by various members of the Survey staff under the direction of the late John Mark Jewett. 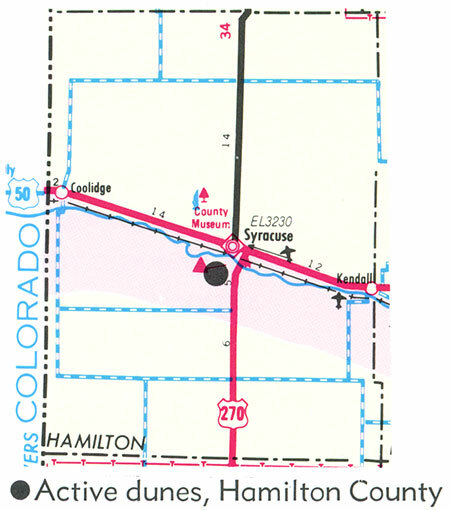 The geologic cross-section along 1-70 was adapted from a detailed section prepared by Charles K. Bayne. Color slides and photographs not taken by the author were from the photo files of the Survey. Many were taken by Grace Muilenberg, Ada Swineford, and Dan Merriam. The manuscript was read by Charles Bayne, Howard O'Connor, Paul Hilpman, Grace Muilenberg, Ada Swineford, JoAnne DeGraffenreid, Gary Waldron, Nancy Parker, and others. Their suggestions were incorporated into the final text. Gary Waldron edited and managed the final preparation and printing. Sharon Hagen prepared the physiographic provinces and generalized geology color maps. Carla Kuhn prepared many of the other figures and composed the layout and cover. Donna Saile, Joyce Budai, and Kaye Long typed various phases of the manuscript. Clark, John G., 1970, Towns and Minerals in Southeastern Kansas: A Study in Regional Industrialization 1890-1930: Kansas Geological Survey, Special Distribution Publication, No. 52, 147 p.
Eicher, Don L., 1968, Geologic Time: Prentice-Hall, Englewood Cliffs, N.J., 149 p.
Jewett, John Mark, and others, 1964, Geologic Map of Kansas: Kansas Geological Survey, Map M-1, scale 1 :500,000. 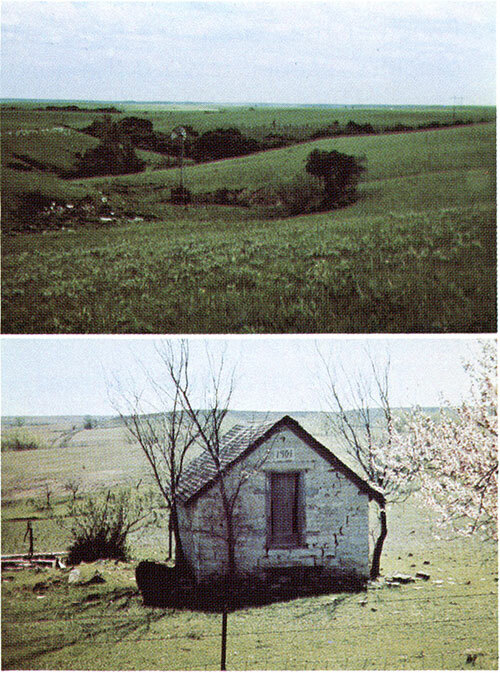 Muilenberg, Grace, and Swineford, Ada, 1975, Land of the Post Rock: University Press of Kansas, Lawrence, Kans., 207 p.
Schoewe, Walter H., 1949, The Geography of Kansas, Part II, Physical Geography: Transactions, Kansas Academy of Science, Volume 52, No.3, pp. 261-333. Tolsted, Laura, and Swineford, Ada, 1969 reprint, Kansas Rocks and Minerals: Kansas Geological Survey, Educational Series No. 2, 64 p.
Placed on web July 14, 2016; originally published 1978.